The K1 outfit has generally provided pleasure for our three years of ownership. Paralever bearing failure led to fairly radical amendment (see Converting the K), but we are satisfied. The experience has been good save for the somewhat sporty K1 riding position. Slightly higher bars and risers improved matters, but didn't completely resolve matters for my ageing torso due to the restrictions of the fairing design. 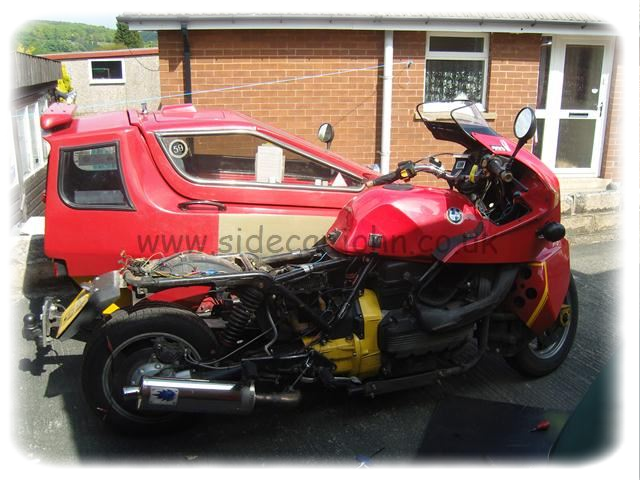 A gap in sidecar activity presented itself and the conversion began. Other jobs included replacing all lights, except the headlight, with LED units, or bulbs, and a suitable turn signal relay. This meant abandoning the BMW's strange three switch indicator system – left handlebar, right, and a cancel - which I'd never got on with. Some puzzling electrical connections, but eventually sorted. A Suzuki left handlebar switch, plus Suzuki clutch lever do the honours. The cold start control is courtesy of a Honda CX500. 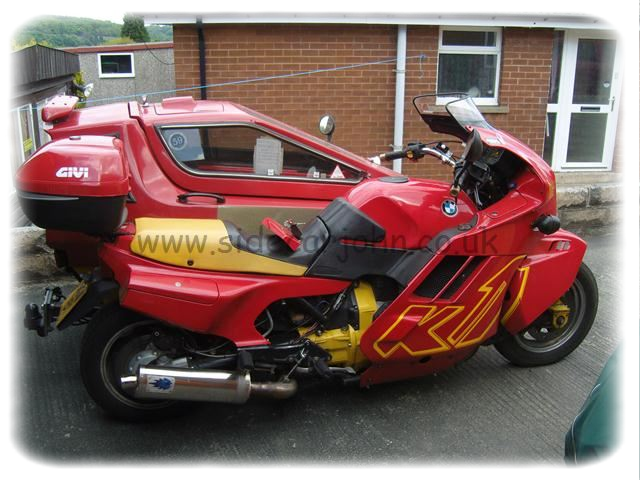 The solution, which probably offends the purists, settled on replacing the total K1 bodywork with that off a K100 RT. Some months trawling internet sources concentrated on finding an RT fairing. A couple of near misses, and prices eventually determined it might be best to seek out a complete bike. Eventually one was found at a reasonable price, and in acceptable condition. Relevant parts were removed from the donor bike for spraying, which also highlighted the need for more than just the fairing, notably the seat arrangement. The potential cost in time and money seeking out all the bits eventually required justified the whole bike choice. Fitting the RT fairing meant using its main mounting bracket, and relocating the ignition switch from its top yoke K1 position. Other considerations included a standard K100 coolant header tank. The K1 has a unique upper fairing position, which had meant inconvenient panel removal to access, as well as being very awkward to fill. Now a more conventional K bike location alongside the battery is easy to check and replenish. Some minor work to fit the RT seat with a worthwhile outcome. The difference in the K1 and standard K100 frames required the removal of a couple of redundant frame tags for a perfect fit. Removal of the original widened K1 front mudguard and brackets has produced a preferred open front fork arrangement. The forks and subframe mean the RT radiator surround part of the fairing cannot be used, so some creativity kicked in. Black plastic gutter may not be everyone's idea of style, but functionally it has proved acceptable. A steel mudguard , sourced in a mate's workshop, was cut to fit. This was powder coated, as were the front wheel and brake caliper mounts, and completes this part of the bike. Would the purists approve ? Do I care ? At the rear of the bike the opportunity was taken to address a disintegrating mudguard, which actually didn't function very well at all with the offset rear wheel. A plastic trailer mudguard was chosen for function and fit, requiring minimal alteration. The top box also came courtesy of the donor K100RT. The whole is complemented by the donor bike's RT handlebars, which provide the more comfortable riding position, which was the prime aim of this particular project. A 250 mile shakedown ride in very variable weather conditions, no it rained a lot, confirmed a positive outcome. Some left overs requiring minimal attention, as well as some further additions – LED running lights, hazard switches, and sidecar alterations, but pleased nevertheless. POSTSCRIPT - Nearly forgot, the new set up necessitated moving the ignition switch and cold start to a convenient spot in the side fairing.